Every time I see a company come out with a new line of simulations, I get worried, due to two concerns that immediately cross my mind. First, will they botch it completely? This is less likely, since in the past several years, the war simulation has undergone an evolution. Call it a software natural selection, which has resulted pretty much in an acceptance of the best way these games should be designed. Unfortunately, this gives rise to the second concern that the new entry will offer nothing new, a syndrome that has been prevalent as of late. In these two new simulations from Datasoft, each of these permutations is explored and with surprising results. Firezone, a game of 21st century warfare, succeeds nicely in bringing to the ST two things I haven't seen combined often enough: classic simulation design and a futuristic setting. Using such armaments as anti-grav powered tanks, energy shields and beam weapons, the two remaining superpowers, the European League and the Pacific Combine, fight for control of a war-ravaged planet. These new, powerful weapons have bred a new style of warfare, resulting in battles that last only minutes, rather than hours or days. Your window into this world is a simple program that allows the computer to control either or both sides as well as supporting two-player games. 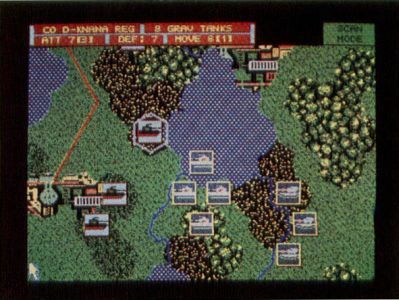 Difficulty level is controlled by selecting whether enemy units are hidden or not, and play begins upon the selection of one of the nine scenarios. Veterans will immediately recognize the hexagonal grid of the battle map as a carryover from board-based war games. Likewise cribbed are the simple movement and battle phases that comprise each of both sides up to 50 turns. Newcomers will easily learn the sequence of game play, in which each player moves units, then selects targets for his units to fire upon. Play continues until there is a winner. Probably the worst aspect of Firezone is its simplicity. With few options and an extremely limited and simple command structure, the game is-best suited to newcomers. Experts are bound to be disappointed. Additionally, while Firezone does not sport the most technologically advanced graphics I've seen on the ST, the playing field, which comprises multiple screens, is adequately detailed to allow easy identification of terrain conditions and troop characteristics. Scan mode allows you to scroll easily about to reveal all the action. 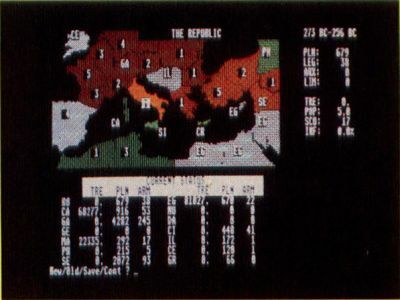 The top of the display contains a status bar that provides such valuable game information as score, unit and terrain info, current mode and whose turn it is. The manual is well done, featuring a quick-start section and background information and strategy for three of the scenarios. The remaining six scenarios are left entirely to your exploration. 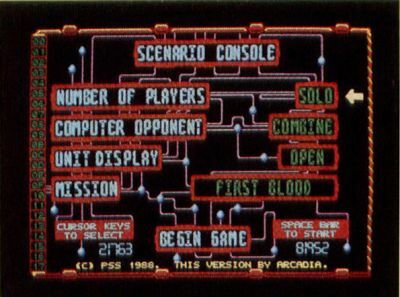 One final aspect of the game is the ability to create and save your own scenarios via the Gamegen program. With this simple editor you can modify existing scenarios, or create new ones from scratch. I really liked the way that once your scenarios are placed on the game disk, your titles then appear on the opening option menu. In the end, Firezone succeeds by not trying to introduce anything new. This is a classic simulation for the ST, and it gives me just what I want in entry-level simulations: simplicity. True, unlike the ultramodern UMS and Empire war games, Firezone is merely the conversion of a tried-and-true formula to a new medium. And for that reason, most buyers should know just what they will get upon booting the disk. Recommendation: Get a demonstration first. Annals of Rome, on the other hand, is very different from other simulations you might have played. In some ways it resembles the board game Risk. In others, it resembles an upper college-level history thesis. Unfortunately, I found its complex historical foundations and politically-based game theory a little too esoteric for me. Still, there is room for disagreement, and it is worth checking out. 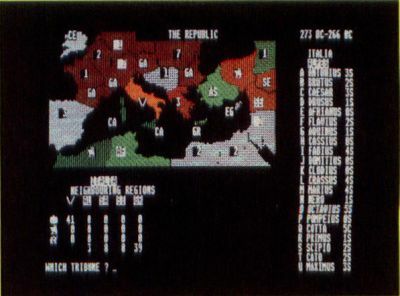 Set in 273 B.C., the game features a static main display that contains a map of the Roman Empire. In these, the glory days of the Roman Empire, your role is that of the Senate's ruling body, and your mission is to lead the armies of Rome against the enemies that surround your new empire. And while set against this historical backdrop, truly successful playing might actually change history. Unfortunately, I found the method of play to be difficult to get in to. In this abstract game, play involves more politics than simple battlefield bravado. Play is again divided into a number of phases, such as an economics phase, a personnel assignment phase, a loyalty phase and war phases, during which foreign and civil wars are fought. In these phases, you might set a tax rate to fund a war chest or direct a given officer to command an army. The action most war gamers are used to takes place in the foreign war phase in which you direct your armies to attack neighboring countries. However, while this game design packs in a lot of realism, the actual play of the game is difficult to grasp, and there's no way to simply boot up and begin. For example, a turn begins with a start/save option. The first phase is Economic Phase in which you raise capital, keeping in mind that excessive taxes bring discontent and starvation. Next, the 21 officers available to the senate are displayed, along with the major attributes (ability, age, loyalty) of each, allowing you to evaluate your current generals. In the Assignment Phase, these officers can be moved about, sending strong warriors to capture valuable regions, sending cowards to certain death. A Loyalty Phase identifies which regions and armies are becoming prone to rebellion and gives you the opportunity to bribe them into submission. Finally, opposing forces meet, and the ensuing conflicts are resolved in the Civil and Foreign War phases, after which the cycle repeats itself in the next turn. The manual, while well written, is of little help. It completely explains all the phases and gives helpful hints and a short treatise on Roman history, but it does little to shorten the learning curve—or even entice me to learn. Still, a package as unique as Annals of Rome deserves at least a passing consideration, and I'm sure there are a few war gamers who would welcome its cerebral approach. 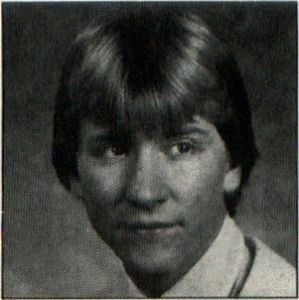 Steve Panak has written more game reviews for ST-LOG and ANALOG than anyone on the planet. He lives in Ohio where he plays games on his ST and, with the time remaining, practices law.